52 Ancestors, No. 10. 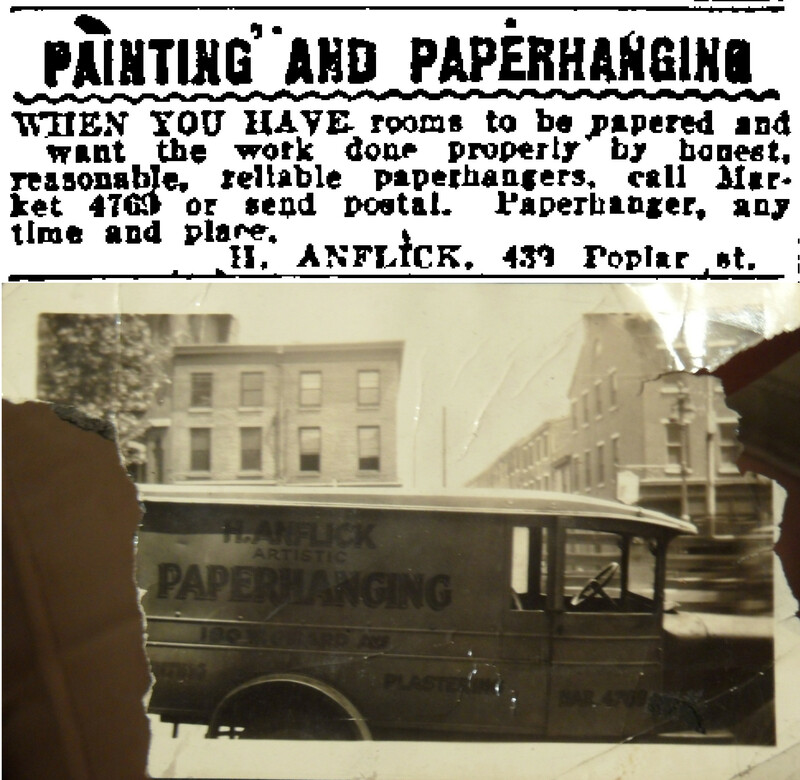 Henry Anflick: An Honest, Reasonable, Reliable Paperhanger | Photo Restorations by Tim G.
Henry Anflick was my mother’s paternal grandfather. Piecing together his early family history has been a conundrum. It may be time to call in the professionals to whisk me away, Who Do You Think You Are? style, to the place of his birth: Odessa, Ukraine. Okay, well, maybe best to wait until things settle down over there. The current unrest notwithstanding, some Ukranian archives are probably the most likely place to find clues as to this man’s origins. 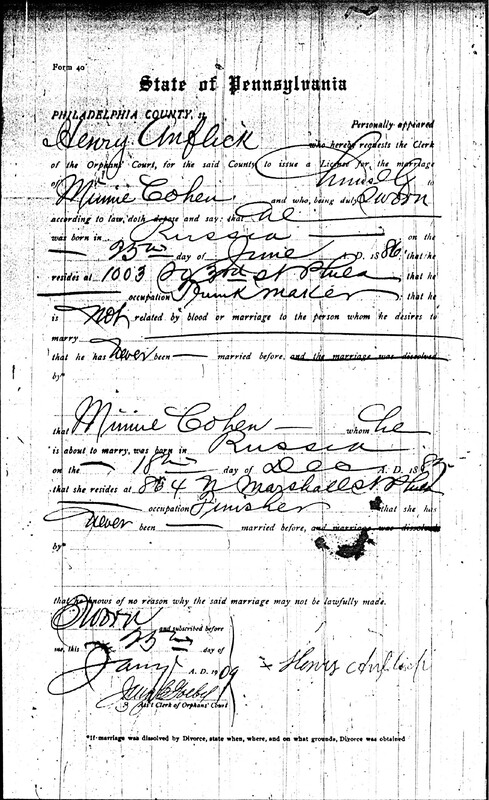 Minnie Snyder used her mother’s maiden name of Cohen on her license to marry Henry. Because the family was Jewish, it’s reasonable to believe that the family came to America to escape pogroms and other increasing unpleasantries. The way I understand the family history, Henry’s older brother, Louis, emigrated to Philadelphia first, in 1899. Once settled, Louis purchased fares for the rest of his family, including his mother, Katie, and his younger siblings, Harry, Andrew, Henry, Mary, and Anna, as they would later be known in America, to set sail the following year. A sister, Sophiya, would remain in Eastern Europe with her husband. The planned departure was cancelled for all but Harry and Henry, who apparently made the trip at the ages of fifteen and fourteen, respectively. They met their older brother, Louis, in Philadelphia, but soon moved to Richmond, Virginia, where Katie already had family. Katie, Mary, and Anna made the trip in 1903, also settling in Richmond. Andrew would join them at some point, as he appears in the 1905 Richmond City Directory, but, documents on him being scarce, I don’t know anything else about him. The directory shows is occupation as candymaker. Sweet. Most of the family would eventually move back up to Philadelphia. Aside from Andrew, who remains unaccounted for after 1905, the only one who apparently didn’t eventually move to Philadelphia was Harry, who instead moved to London, England, in 1914. Even Katie’s relations, including her brother-in-law, Aaron Schachter, and his family, would be in Philadelphia by the early 1920s. Louis’s gravestone bears the Kohen hand symbol. The big Anflick family puzzle is: Who fathered these children? The family story as I once understood it, was that a man named Simon Anflick fathered Louis and Sophia. Although another man named Al fathered the other children, Al agreed to their keeping the Anflick family name. Al’s children would each honor him by naming their first-born sons some variation of Al. Henry and Mary therefore each named their first-born sons Albert, and Anne named her first-born son Alexander. Part of the reason for the name games, my uncle explained to me, may have been an attempt to preserve the family’s privileged Kohen status. Other interesting name choices give color theory. For example, when Henry married is wife, Minnie, in 1909, she used her mother’s maiden name of Cohen on the document, rather than her father’s last name of Snyder, by which she was commonly known. These people are no longer around to explain their actions, so the best I can do is speculate. 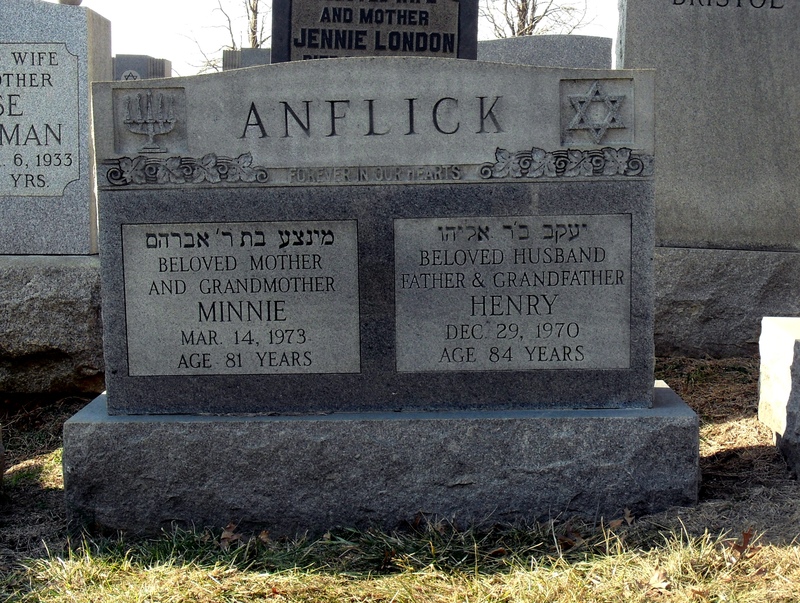 Both Henry and Anna identified their father as Al Anflick. As often happens, documentary evidence has slightly modified the story. 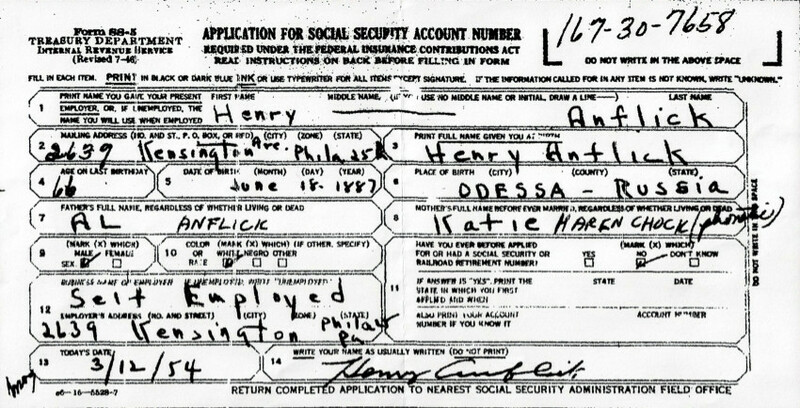 Both Henry and Anna submitted SS-5 Social Security applications indicating that their father’s full name was Al Anflick. I’ve never seen Simon’s last name in print, so there is a possibility that his name was different. 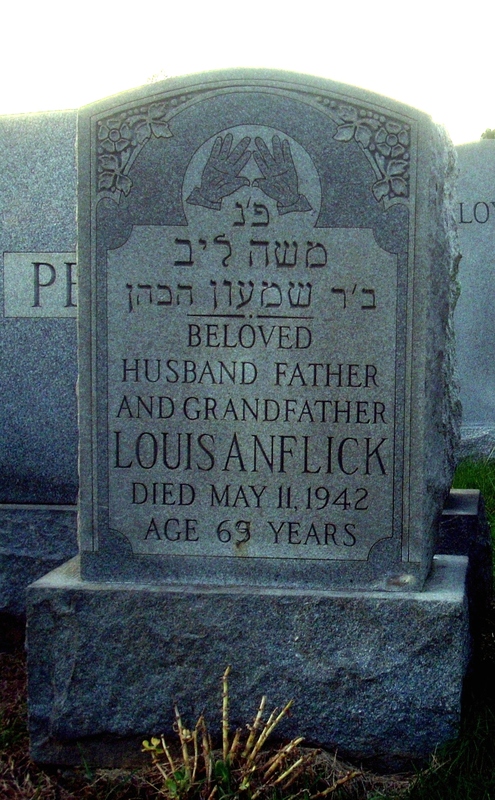 My uncle also had DNA testing reveal Kohen markers, suggesting that Al Anflick was the ‘true’ Kohen, and that Louis was the one who came along for the ride. Perhaps both Simon and Al were ‘true’ Kohens. Again, I can only speculate. Of course, Harry threw a monkey wrench into the works when he identified his father’s name as Benjamin Anflick on his English naturalization application. All I can say for sure is that I really don’t know what these people were thinking. Henry Anflick’s classified ad fromt he Philadelphia inquirer, 6/18/1921, and work vehicle. As for Henry’s personal life, I should probably know more than I do. 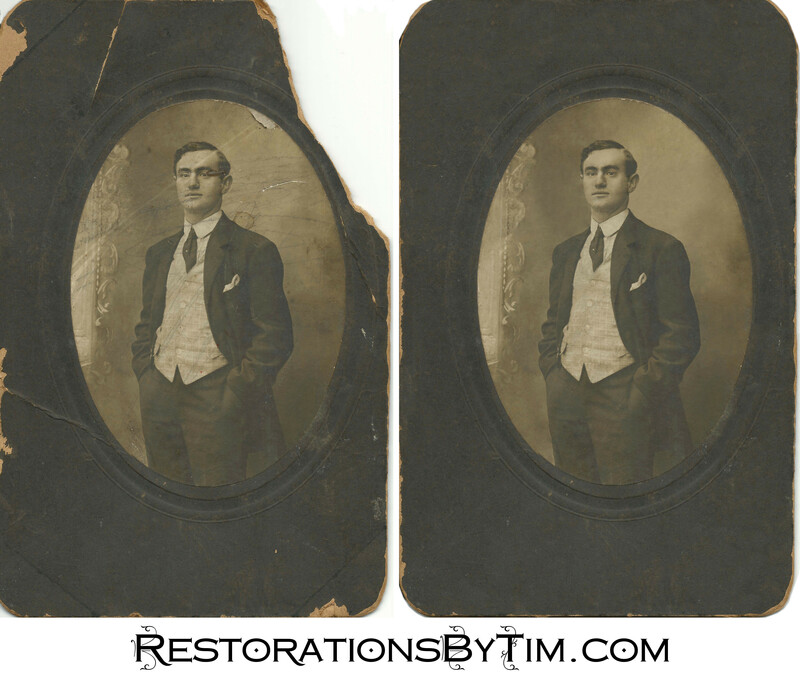 After one stillbirth in 1909, he and his wife, Minnie, had seven children, including my grandpop, Morris. After her children were born, Minnie would spend many of her remaining years as an inmate at Byberry state psychiatric hospital for a condition that, my mother’s cousins tell me, doctors would nowadays treat with anti-depressant medications. Henry was a wallpaper hanger, by trade, but would operate a gift shop in later years, on Kensington Avenue, under the Market-Frankford elevated train. On the side, he was a committee member of the American Fraternity, a Jewish beneficial society in Philadelphia. Henry would outlive two of his seven children. His daughter Celia and son Albert would each die of tuberculosis, the former in 1936 at the age of 21, and the later in 1952, at the age of 41. Henry himself would die after a heart attack on December 29, 1970, at the age of about 84. He is buried at Montefiore Cemetery in Rockledge, Pennsylvania, just northwest of the Philadelphia. Many thanks to my Uncle Craig, and to my mother’s cousins Melodee and Skip for sharing their memories of Henry and Minnie, and also to Melodee for sharing many pictures, and especially the one of Henry’s work vehicle.